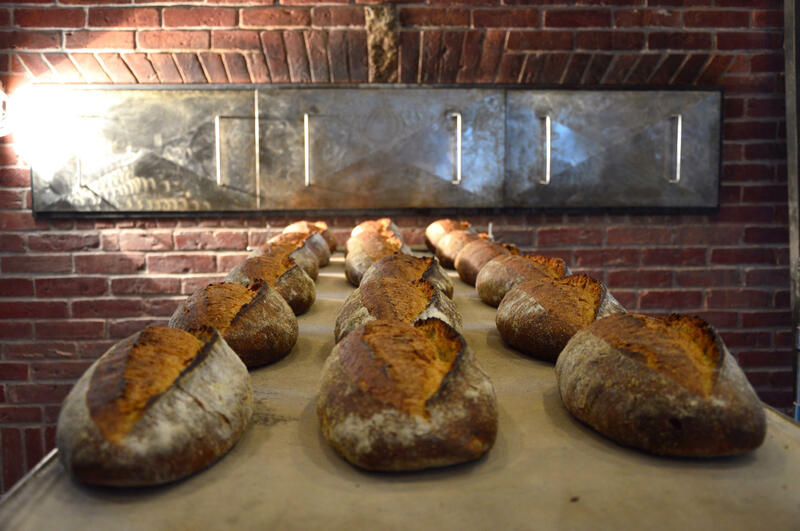 Breads baked at the Elmore Mountain Bread use freshly stone milled flour. Elmore Mountain Bread has a custom-built stone mill. 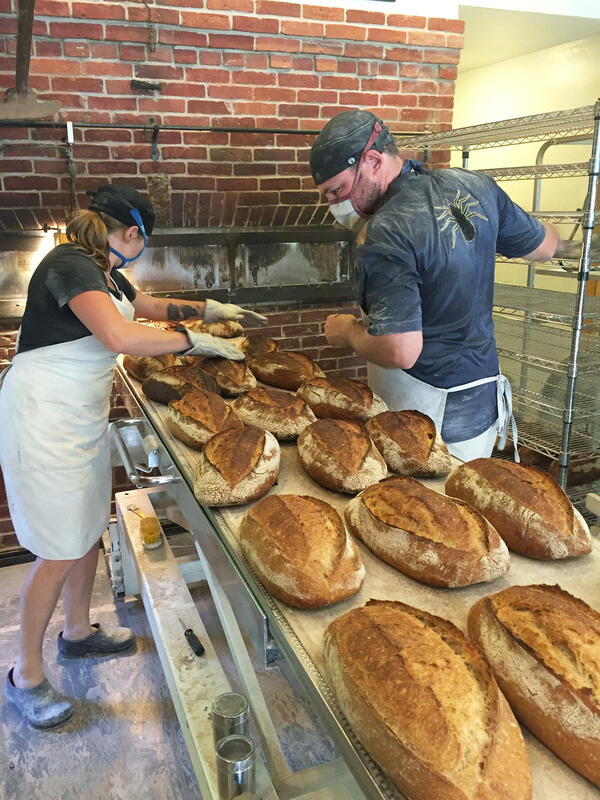 Blair Marvin working with the head baker at Elmore Mountain Bread. Nestled among rolling hills and grazing cows, Elmore Mountain Bread in central Vermont is quintessentially pastoral. The setting is apropos, given the owners' recent decision to start grinding their own flour by stone — a veritable step back in time. Blair Marvin, who co-owns the bakery and mill with her husband, Andrew Heyn, says the motivation to build the mill came from a fellow baker in North Carolina, who sent them a surprise shipment of his own freshly milled flour about four years ago. Typically, flour has an almost dusty odor, but this flour smelled earthy, Marvin recalls. "We were like, 'whoa, whoa, whoa!'" The couple had been thinking a lot about what they were putting into their bread. They'd recently had a baby — Phineas — whose foray into solids involved a diet heavy in baguettes. The flour they were using was organic but industrially produced. That shipment made them realize, says Marvin, "that we could control every step of the process" and create a loaf that tasted as good as the flour they were smelling. 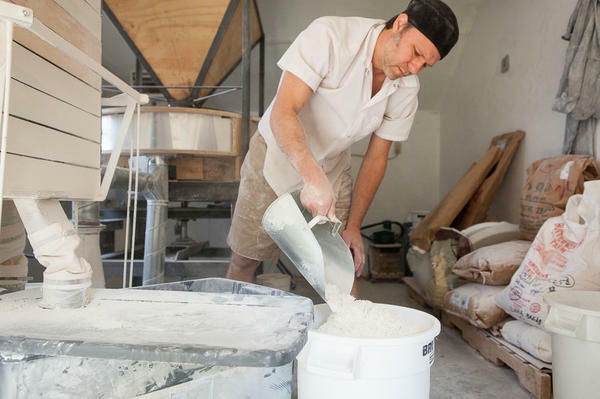 In building their own mill, the couple joined a growing movement among bakers, chefs and pasta makers to go back to using grains pulverized the old-fashioned way. Wheat ground through a stone mill not only tastes better, argue these converts, it's also more nutritious than conventionally milled flours. What's more, small-scale millers tend to buy grains from farmers in the area, which supports the locavore movement. "The milling revolution," Marvin says, "is happening right now." The stone mill at Elmore Mountain Bread, which is housed in a garage just off the bakery, is as tall as the ceiling and contains a giant funnel. The grain, fed through this funnel, spills onto two 700-pound, circular granite stones, which grind anything atop it into flour. Stone milling this way crushes and combines the wheatberry's exterior bran, starchy endosperm and oily germ — the grain's nutritional powerhouse — to create flour rich in fiber and omega 3s. But the presence of germ also means that the resulting flour will perish within weeks. Humans have milled with stones for millennia. But in the late 1880s, roller mills began to replace that older technology. Those industrial mills contained enormous spinning cylinders that sheared away the bran and germ, leaving only the endosperm — aka white flour. 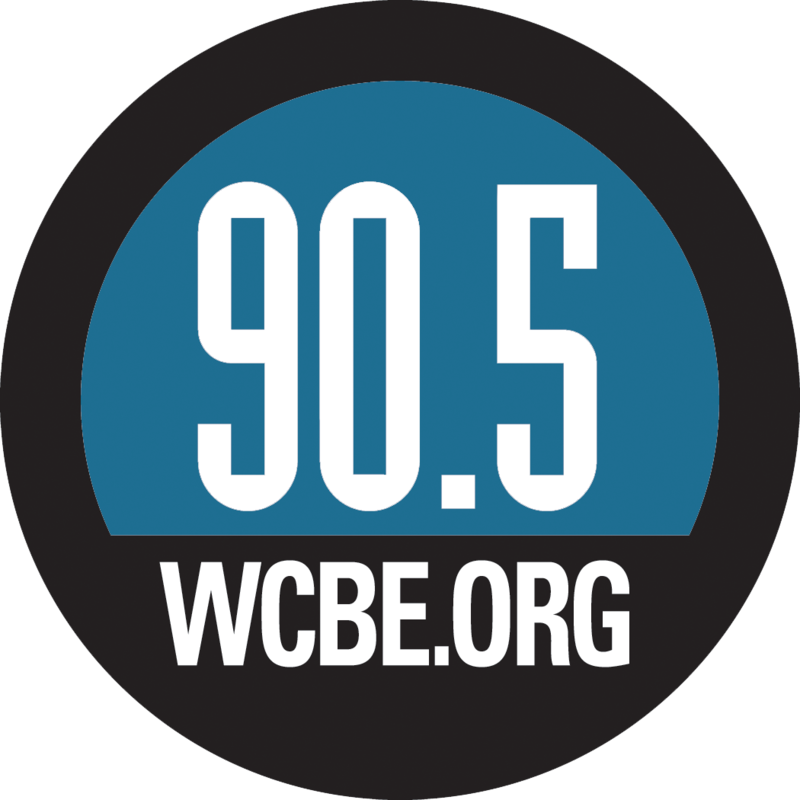 White roller-milled flour was nonperishable, easy to use, and meshed with consumers' growing preference for lily white, "pure" foods, says Stephen Jones, director of the Bread Lab at Washington State University. Roller milling gradually centralized and homogenized the flour production process. It also promoted the growth of ever larger wheat farms, which wiped out the smaller guys. But those farmers are staging a slow comeback. Jones has been working with hundreds of farmers from Alaska to southern California to breed and grow different varieties of wheat. "You can't just use any wheat," Jones says. "You have to find the right variety." When a variety succeeds, the wheat is brought into a lab, where professional bakers try working with the product. Some wheat varieties end up being good for pizza dough or tortillas, while others are better suited for bread, Jones says. Other strains never make it past the testing stage. Back in Vermont, Marvin found a local farmer who was growing a variety of wheat known as Redeemer. She bought his entire harvest, or about 12 tons of grain, to get started. But worried that their new approach would alienate loyal customers, Marvin and Heyn decided to attach their mill to a sifter that could extract bran. Bread milled this way still contains the nutrient-rich germ and a bit more bran than white flour, but retains a more familiar taste and texture. But this approach is controversial in the grain world. "Some of these millers are recreating white flour by a different name," argues Jones, who sees a return to whole grain bread and pasta as the logical end product of stone-ground milling. Nutritionally speaking, breads made with whole wheat flour are undoubtedly healthier than those made with white flour. But things get muddy when comparing, say, a loaf made at Elmore Mountain Bread versus a whole wheat loaf made from roller-milled flour that you might buy at the supermarket. That "whole wheat" label at the supermarket can be misleading, because roller-milled whole wheat flour is typically made by first separating the endosperm, bran, and germ and then adding them all back together. According to Food and Drug Administration guidelines, flour can be called "whole grain" if only 51 percent of all those components are added back in. By contrast, the sifted flour at Elmore contains more than half the bran and all the germ. It's not clear how much bran and germ commercial bread producers are adding back in (it could be 51 percent, 100 percent, or somewhere in between), but it could be less than those components in flour milled at Elmore. Moreover, the roller mill's separation step destroys many of the vitamins in the wheat layers, which remain better protected in the stone milling process. What's needed is a way to compare the nutritional composition of flours across the spectrum, says Josey Baker, owner of The Mill in San Francisco. "I want nutritional analyses of bread made with white flour, with sifted flour, with whole grain flour, with fresh whole grain flour." No matter how a baker with a mill sources their wheatberries and makes flour, making bread remains the hardest step. Baker says his early attempts at using freshly milled flour weren't very successful. "We had customers say, 'What happened to your bread?' "
That's because milling in-house means that a baker must decide everything from how finely to grind the flour to how much water to add for the right consistency. Recipes must be tweaked from season to season to accommodate for different varieties of wheat. Through a lot of trial and error, Baker says he finally re-learned how to bake a loaf with great flavor and texture. Ironically, Marvin says she only realized the new setup was working after receiving a call from a disgruntled customer, who claimed the Country French bread was "too wheaty." That the customer was complaining about the bread's central ingredient, Marvin says, "was a backhanded compliment." Sure enough, the gentleman came around to his new, wheatier loaf and remains a loyal customer. Other customers followed suit. So, too, did bakers, who regularly frequent little Elmore to check out the mill for themselves. And then there's Phineas, today a 5-year-old bread connoisseur who can distinguish among all those varieties of bread even if he's still partial to the baguette. Marvin says the milling experiment gives her hope that kids will grow up knowing that bread can be wholesome and tasty, that it's more than "something that can be squished into a tiny ball and sit on the counter for months."